1. 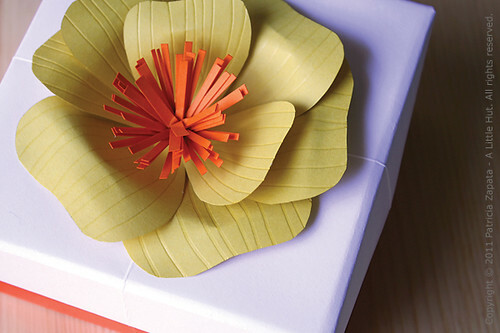 Make a new type of gift box. Hint: The flower isn't simply sitting on the cover. 2. Figure out how to make an origami box that had a narrower cover, so that the bottom box color is visible on the sides. So, for now, I'm quite pleased. Ask me how I feel in a few hours. I'm sure my body will be reminding me that I am no longer a college student that can run on fumes and coffee. Those were the days! Thank you to those of you that have responded to my Facebook post. I really didn't expect much at all. But I knew I had to get it all off my chest. It's nice to know that I'm not alone and not out of my mind. So thanks! I hope you come by tomorrow because I'll be having a small book book giveaway. I haven't had one of those in a long time. This is a good one—all about paper!